The Frenchman's Food & Wine Blog: Ristretto, Howard Street: The best coffee in Perth ... ever! Ristretto, Howard Street: The best coffee in Perth ... ever! I never imagined it possible, but I recently had the best coffee in my life. Ever. I decided to check out this newly opened coffee place in Howard Street (which runs between St George's Terrace and The Esplanade) - it's called Ristretto. ﻿ Anyway, it's a very unassuming place from the outside - nothing flashy, with paper signs displaying the name of the place. But when you walk inside the stark, minimalist establishment with Scandinavian style blonde wood furniture, it becomes readily apparent what the focus is on. The gleaming, shiny coffee machine dominates the place, and behind the counter in the "kitchen" sits a coffee roaster. I order an espresso, as is my wont to do, and was struck by how the barista intently peered at the twin trickles of coffee pouring out the twin spouts of the portafilter. And then I received my libation - the cup was hot, which is a good start. Nice caramelly coffee nose. Even better. Take a sip ... wow. Thick, rich, flavoursome crema. Take another sip ... more crema. Take a third sip ... even more crema! This coffee was unbelievably rich and thick, with subtle sweetness (berry-flavours, according to the barista), and an astonishingly long, crisp, dry finish. You would have thought I was talking about a young riesling. Well, it did have apple tartness. My mate Cabron ordered a latte, and even with all that milk, he was pleasantly surprised by the flavour of the coffee, apparently the berry flavours are more pronounced with milk. I got talking to Emmanuel the chilled out, jovial barista, who also runs the joint. This man is a true artisan. He sources and roasts his own beans, and knows the people behind some of my favourite coffee places in Australia, like St Ali. According to Emmanuel, the secret to thick, rich crema is to stop the roasting just short of what commercial wholesale roasters often do, and to ensure that the water temperature isn't too hot. Of course, using only freshly roasted beens (rest for a week, then use in the next week or two) is essential - the older the coffee, the thinner and more ephemeral the crema. I buy a bag of the "berry-flavoured" blend from him, and he generously throws in a small bag of an El Salvadoran 2010 Cup of Excellence winner - a bourbon variety from Las Nubes I (farm), located at Sonsonate in the Apaneca-Ilmatepec region of El Salvador. Ranked 27 out of 30 with a score of 84.39, I was most excited to try it. Ristretto - remember the name, and do yourself a favour. Pop in to get a coffee, and you will surely not regret it. Post-note: When I finally got the chance to try my new treasures at home, I was amazed at the thickness of the crema. Not quite what I experienced at Ristretto, but still easily the best coffee that Miss Silvia has ever made for me. Make sure you try this at home! The picture on the right shows the difference. The coffee on the left is made from freshly roasted Ristretto beans, while the coffee is made from beans almost a month after roasting. I used the same grind setting, same amount of coffee, tamped them the same way and ran the water through them for the same amount of time. 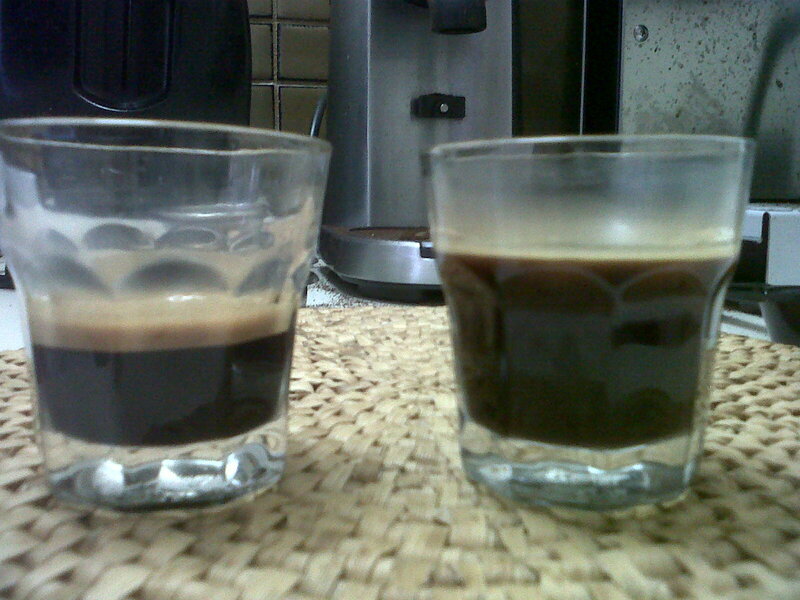 As you can see, the older coffee is less watery and has an extremely thin crema. Yeah, Ristretto rocks! I went to it for years when it was a tiny hole in the wall in the Paragon Arcade near Central Park. Even a few years later when I ventured downtown for a meeting and dropped in for a Ristretto fix, they remembered my usual order! Very impressive if you ask me :) I haven't tasted better coffee anywhere else in Perth, and glad to hear that they are expanding! 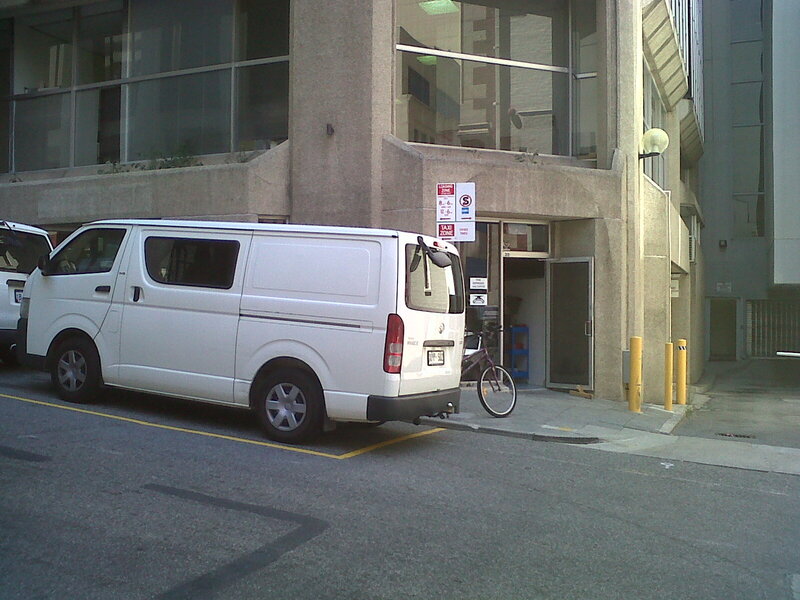 Yes indeed - I've just added a picture of the entrance, which sadly is often blocked by delivery vans. Just look for it at the corner of Howard Street and Howard Lane! I always have it with me so it's fast and delonghi esam3300 magnifica coffee machine convenient, and I have fun pushing the boundaries of what the mechanics are capable of.